Inspired by the Bauhaus movement and using scientific principles to make the best coffee with a pure flavour and no bitterness, the Chemex coffee was designed in 1941. Elegant and simple, the hourglass-shaped heat-resistant glass coffee maker has been displayed in New York’s Museum of Modern Art design exhibitions and is perfect for making coffee for friends. If you prefer espresso try the Aeropress, which is not as pretty as the Chemex but brings out the breadth of flavours in a the beans and makes incredibly smooth-tasting shots. Both are available by mail order from Origin, a small, ethical coffee company based in Cornwall, or if you’re London-based try Prufrock on Leather Lane or Ozone Coffee on Leonard St.
Just opening our Chantal Coady’s new book, nestled inside a Rococo gift box with its ribbon tags and fuchsia page edges, is a pleasure. Mastering the Art of Chocolate is filled with beautiful photography, clear recipes (both savoury and sweet) and Chantal’s journey as an entrepreneur. To celebrate 30 years of Rococo, we’re currently (December 2013) offering 30% off the book bringing the price down to just £24.50. You’ve eaten caramelised onion chutney, love tomato chilli jam and tried goats cheese and chocolate canapés. You know savour-salty-sweet tastes work together, but have you tried bacon jam? Eat 17’s version is available in Waitrose and some Tesco stores, and they also sell smoky and chilli versions. I have to admit I’ve only tried homemade bacon jam, but if this is anywhere near as good Niamh’s recipe at Eat Like a Girl, then Eat 17 are onto a winner. If Santa’s reading this, the chorizo jam is on my list please. John Lewis are stocking these Vera Wang for Waterford cut glass champagne coupes, a subtle update of an elegant, traditional design. Coupes, also known as saucers, are perfect for classic Manhattans, sidecars and other straight-up cocktails as the stem prevents your hands from warming the drink. These hand-blown versions from LSA with their gold-painted rims and beautiful curves are a good alternative. A Thermomix certainly isn’t an impulse gift but our founder Chantal loves hers, using it to make everything from chocolate ganache and ice cream to soups, smoothies and Marcella Hazan’s legendary tomato pasta sauce. She also says that it makes the best apple sauce within 5 minutes without any need to peel the apples. But the best thing about the Thermomix? Apparently, it cleans itself. The Gift Collection from the Rare Tea Co showcases their permanent tea collection, sourced directly from farmers. Chantal drinks these teas at home, and the delicate white silver tip tea is particularly special. They also offer a Rare Tea Subscription that includes options for receiving unusual and small-batch teas. There aren’t many places with convenient parking for reindeer in central London, so Santa’s taken to zipping about on this cute Lambretta. This figurine is hand-painted on a thin layer of white chocolate to make the colours sing, and backed with dark chocolate. Buy it here or in our shops. A good chef’s knife is the most important kitchen tool for any cook. German and Japanese style knives are both highly regarded, with the German style tending to be heavier and easier to sharpen while the Japanese style is known for being hard-wearing with razor-sharp points. Global knives have a great reputation, and this 20cm cook’s knife with sharpener is a good starting point. Can’t decide what to buy for the grandparents/in-laws/boss? A food hamper is always a good option, and our favourite this year comes from Ottolenghi, our neighbours in Motcomb Street. Fortnum & Mason is, of course, the grande dame of hamper suppliers, and of course we have chocolate-filled hampers that will keep the whole family happy for days. I’m prepared to admit that nobody needs a brie baker. But this retro delight is due a comeback; let’s face it, practically everyone loves melted cheese, and there are few other dinner party starters that will elicit such delight for so little work. John Lewis sell the red version of this porcelain brie baker from Wildly Delicious, while Lakeland stock the white. For a spectacular addition to the Christmas table, Brindisa’s Jabugo Ibérico pequeno ham set comes with a wooden stand, a knife and a carving DVD. This Ibérico cebo de Campo with deep, lingering flavours comes from a traditional artisan producer whose pigs are fed on cereals, grains and autumnal acorns. Brindisa sell a number of different specialist ham sets as well as hams on the bone, off the bone and pre-sliced to go alongside their great range of Spanish olives and nuts. 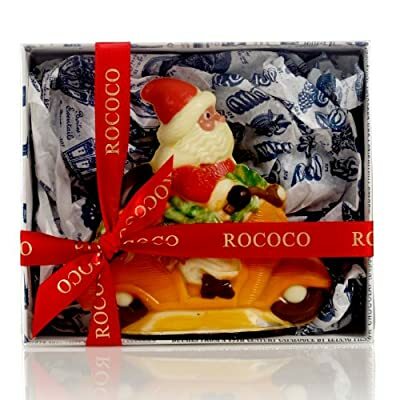 Sophie Dahl told The Times, “if I could wave a magic wand, I would always have a fridge full of Rococo’s Sea Salt Wafers. They make brilliant little Christmas presents, although in my house they last about five minutes.” Who are we to argue with her? Have you seen our other gift guides? Click here for stocking fillers and gorgeous green gifts.